The All Arunachal Pradesh Earthmovers Welfare Association (AAPEMWA) today demanded immediate ban of illegal earth cutting works in the entire capital complex and its adjoining area. AAPEMWA in a memorandum submitted to Capital Complex Deputy Commissioner stated that the district administration order banning all kind of illegal earth cutting by the earthmovers are not followed by some earth mover/earth cutters etc and it have been observed that several earth cutting in capital complex is still going on without any fear of the administration. AAPEMWA President Likha Ekha while talking to this daily said anyone can see several illegal earth cutting work during this rainy season which are detrimental to the landslide and landslips and danger for loss of life and property which we have been experiencing in the recent past. Several source of landslide in capital complex are due to cutting illegally where several life and property have been damaged and the general public have to suffer allot. 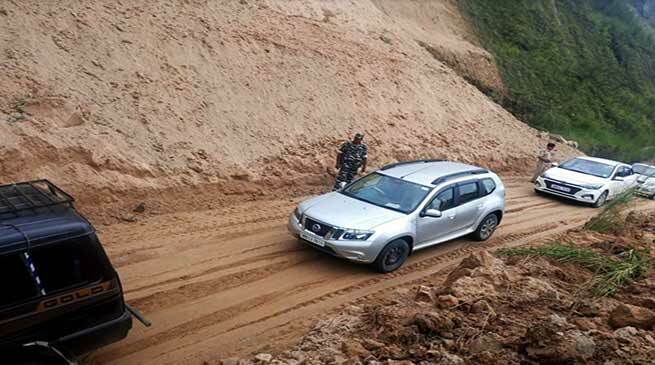 Stating that the hilly and porous land are loose which may cause fatal soil erosion leading to damage of valuable human lives and properties giving a glittering examples are the blockage of Naharlagun-Yupia and several other road which is resulted due to illegal earth cutting works. He appeal the capital district administration in order to avert future destruction of human lives and properties due to landslide all kind of illegal earth cutting work is to suspended during the monsoon season except the restoration and emergency works. He said. AAPEMWA while lodging strong complaint to district administration and demanded for strict checking of all kind of earth cutting during monsoon season and stated ‘prevention is better than cure’ and appeal for legal action against defaulters. Arunchal: NPP emerge as the king maker after election..?